BEIJING (Bloomberg) -- Leonardo Fioravanti, the designer of the Ferrari Daytona and 288 GTO, has a new job on his hands: transforming a Chinese army motorcycle maker into a global premium car brand. Beijing Automotive Group, which traces its roots to producing sidecar motorcycles for use in the Korean War, hired Fioravanti as a consultant and gave him the title of Chief Design Officer in April. The carmaker unveiled a prototype luxury sedan at the Beijing auto show and has said it wants to make "world-class" cars by 2025. 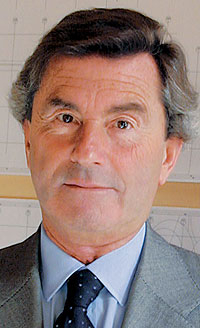 "Chinese manufacturers recognize that they have some problems that they have to improve, one of which is the lack of brand identity," said 74-year-old Fioravanti, who started his career with Pininfarina, the design studio behind the Ferrari 458 Italia and Maserati GranCabrio convertible, in a telephone interview from Moncalieri, Italy. "The first that achieves its own recognizable brand identity and styling language will be the winner." Beijing Auto gave Leonardo Fioravanti the title of Chief Design Officer in April. Beijing Auto is among Chinese carmakers betting that hiring star designers will help burnish their brands and reverse a widening gap in market share led by General Motors and Volkswagen Group. After making progress in recent years in reliability and vehicle safety, domestic automakers are increasingly turning their attention to branding. Chinese brands' share of sedan and compact-car sales fell to 27.5 percent in this year's first five months from 31.4 percent a year earlier, according to data from the China Association of Automobile Manufacturers. None of the top 10 passenger-vehicle models by sales this year belonged to homegrown Chinese brands. The stakes are becoming higher for Chinese automakers as the market matures, leaving multiple brands fighting for market share. Average passenger-vehicle prices fell last month by the most on a month-on-month basis since June 2010, as dealerships cut prices to reduce a glut of unsold automobiles that carmakers are pumping into showrooms. BMW's China partner, Brilliance China Automotive Holdings, hired Italian Dimitri Vicedomini from Pininfarina to head its in-house team. Qoros Auto, a joint venture between Chery Automobile Co. and Israel Corp. that plans to introduce a luxury sedan for China and Europe next year, hired former Mini chief designer Gert Hildebrand in January 2011 to head its design team. Great Wall Motor, China's biggest maker of SUVs, appointed former Mercedes-Benz designer Andreas Deufel as design director last year. Former Volvo Car Corp. chief designer Peter Horbury joined Zhejiang Geely Holding Group as senior vice president in charge of design last year. "Hiring successful foreign designers helps shorten the time needed for local automakers to catch up with world-famous brands like Audi and BMW, which had a century's head start," said Xu Feifei, brand strategy director at Labbrand Enterprise Management Consulting (Shanghai) Co. "With enough time, consumers will recognize that this look belongs to this brand." While Chinese automakers are making the right moves by attracting foreign designers, these highly paid imports can only do so much, said Greg E. Anderson, author of "Designated Drivers: How China Plans to Dominate the Global Auto Industry." "It would be as if Leonardo da Vinci were hired to teach a group of aspiring artists how to create art," Anderson said. "He could never transfer the essence of how a naturally talented artist creates something like the Mona Lisa or the Last Supper." Beijing Auto declined to comment for this story and referred queries about its branding strategy to previously published statements. For local automakers to close the gap with foreign competitors, design quality has to rank more equitably with speed-to-market considerations, said Wang Bo, director of Tsinghua University's automotive design program. Many Chinese automakers give their designers as short as three to five months to come up with a new model design, compared with the more than 20 months that's standard international practice, he said. "What does that do?" said Wang, who helped set up the Tsinghua Automotive Design Center in 2003. "The first response for many Chinese designers is to go on the Internet and copy from BMW and Mercedes and hand in the work." The result is the proliferation of look-alike models. It's also safest to provide new buyers something that's known to sell, said Silvio Pietro Angori, CEO of Cambiano, Italy-based Pininfarina. The company, which first cooperated with a Chinese automaker in 1996, started a product development center in Shanghai and is working with Tsinghua in Beijing and Tong Ji University in Shanghai to train car designers. "In China, there are large numbers of customers who already own a car and they will change cars and look for something unique that speaks to their needs," Angori said in a telephone interview. "That is when the brand becomes relevant." For Fioravanti, Chinese automakers still have a long way to go before they can build a world-famous brand. "Brand development is something that maybe you cannot appreciate immediately, but I think is a long-term investment," said the designer, who travels to China a few times a year from his base in Italy. "You can't expect a new carmaker to immediately reach the standard of the likes of Mercedes, which has been in the business for more than 100 years."